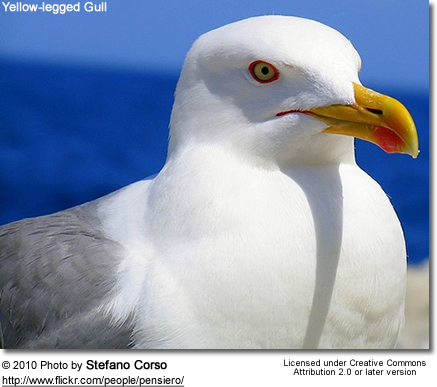 The Yellow-legged Gull (Larus michahellis) is a large gull of Europe, the Middle East and North Africa, which has only recently achieved wide recognition as a distinct species. It was formerly treated as a subspecies of either the Caspian Gull L. cachinnans, or more broadly as a subspecies of the Herring Gull L. argentatus. It is named after the German zoologist Karl Michahelles. It is now generally accepted that the Yellow-legged Gull is a full species, but until recently there was much disagreement. 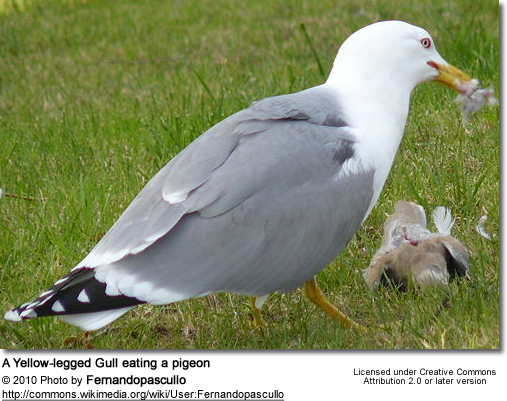 For example, British Birds magazine split Yellow-legged Gull from Herring Gull in 1993 but included the Caspian Gull in the former, but the BOU in Great Britain retained the Yellow-legged Gull as a subspecies of the Herring Gull until 2007. 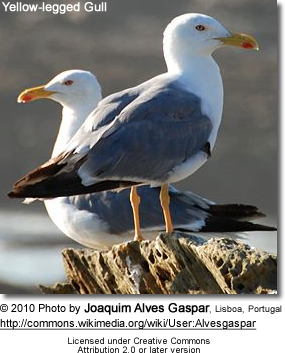 DNA research however suggests that Yellow-legged Gull is actually closest to Great Black-backed Gull L. marinus and Armenian Gull L. armenicus, while Caspian Gull is closer to Herring Gull and Lesser Black-backed Gull L. fuscus, rather than being each other's closest relatives. Larus michahellis michahellis Naumann, 1840. Mediterranean. Larus michahellis atlantis (Dwight, 1922), syn. Larus fuscus atlantis Dwight, 1922. Macaronesia (Canary Islands, Madeira, Azores). Birds breeding on the Atlantic coasts of Morocco, Portugal and Galicia (and spreading north from there) are usually also included here, but are sometimes considered to be a third subspecies L. m. lusitanius. Atlantic Ocean birds have darker wings and back by comparison with Mediterranean birds, creating a more pronounced contrast to the white parts. The breeding range is centred around the Mediterranean Sea. In North Africa it is common in Morocco, Algeria and Tunisia and increasing in places. Recent breeding has occurred in Libya and Egypt. In the Middle East a few breed in Israel and Syria with larger numbers in Cyprus and Turkey. In Europe there are colonies all along the Mediterranean coast, and also on the Atlantic islands and coasts north to Brittany and west to the Azores. It also breeds on the west side of the Black Sea; here it overlaps with the Caspian Gull but there is a difference in habitat, with the Yellow-legged Gull preferring sea cliffs and Caspian Gull on flatter shores. In recent decades birds have spread north into central and western Europe. One to four pairs have attempted to breed in southern England since 1995 (sometimes hybrid pairs with Lesser Black-backed Gulls), though colonisation has been very slow. Many birds remain in the same area all year round but others migrate to spend the winter in mild areas of western Europe or head south as far as Senegal, the Gambia and the Red Sea. There is also extensive northward post-breeding dispersal in the late summer, with numbers in southern England high from July to October. It is reported as a vagrant to northeastern North America and Nigeria. 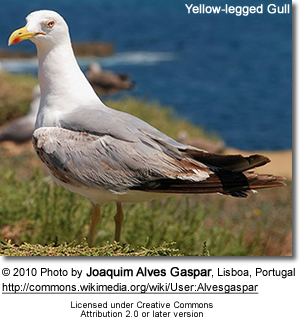 Adults are similar to Herring Gulls but have yellow legs. They have a grey back, slightly darker than Herring Gulls but lighter than Lesser Black-backed Gulls. They are much whiter-headed in autumn, and have more extensively black wing tips with few white spots, just as Lesser Black-backed. They have a red spot on the bill as adults, like the entire complex. 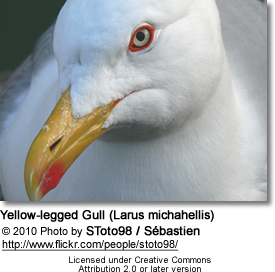 There is a red ring around the eye like in the Lesser Black-backed Gull but unlike in the Herring Gull which has a dark yellow ring. 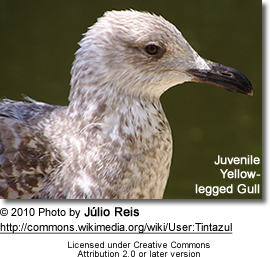 First-year birds have a paler head, rump and underparts than those of the Herring Gull, more closely resembling first-year Great Black-backed Gulls in plumage. They have a dark bill and eyes, pinkish grey legs, dark flight feathers and a well-defined black band on the tail. They become lighter in the underparts and lose the upperpart pattern subsequently. By their second winter, birds are essentially feathered like adults, save for the patterned feathers remaining on the wing coverts. However, their bill tips are black, their eyes still dark, and the legs are a light yellow flesh colour. 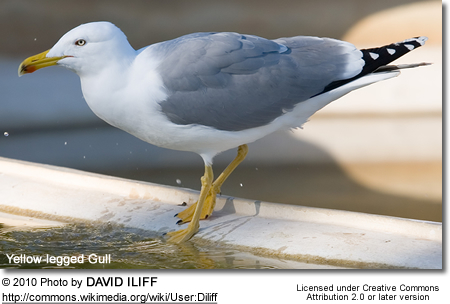 They are omnivores like most Larus gulls, and they will scavenge on rubbish tips and elsewhere, as well as seeking suitable prey in fields or on the coast, or robbing smaller gulls and other seabirds of their catches. 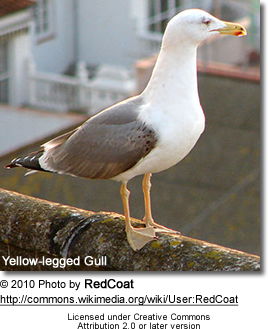 Yellow-legged Gulls usually breed in colonies. Eggs, usually three, are laid from mid March to early May and are defended vigorously by this large gull. The nest is a sometimes sparse mound of vegetation built on the ground or on cliff ledges. In some places such as Gibraltar they have started nesting on buildings. The eggs are incubated for 27–31 days and the young birds fledge after 35–40 days. The call is a loud laugh which is deeper and more nasal than the call of the Herring Gull.